Peppermint bark, to me, is all my favorite flavors of Christmas wrapped up in one dangerous package. 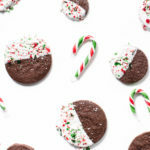 I know, I know, I complained about the Thomas Keller chocolate cookie dough in my post on Corgi-Os, but the truth is, his chocolate cookies are really, really good. Crisp, deeply chocolaty, and oh so addictive. So, since I happened to have some dough leftover in the fridge, I rolled it, cut it, dipped it in peppermint scented white chocolate, and sprinkled on crushed candy canes. 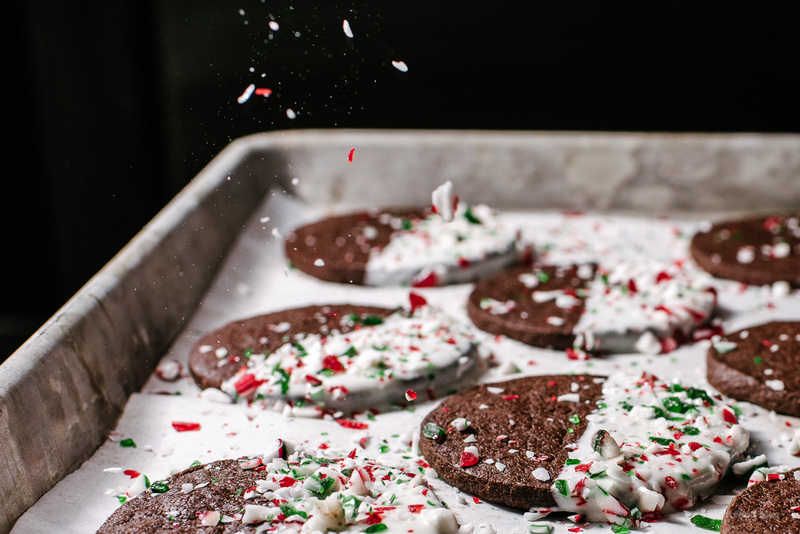 Because: peppermint bark cookies. 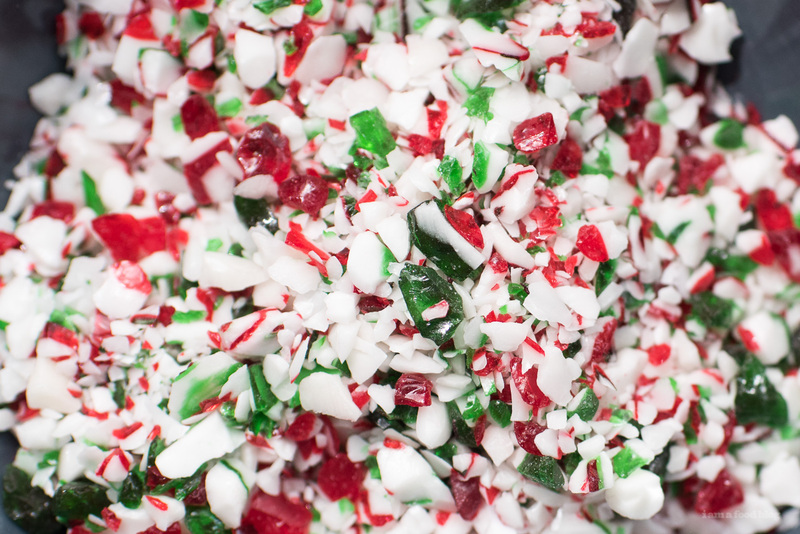 Peppermint bark, to me, is all my favorite flavors of Christmas wrapped up in one dangerous package. Last year, Mike bought me a bunch of mini bars – I didn’t want the giant tin because bad things would happen – and I ate them all before the second week of December. More recently, before we left Vancouver, I spotted pints of limited edition peppermint bark Haagen Dazs. I bought one and it was gone, in about a minute. I loved it so much that we bought a second pint, which is patiently waiting, tucked into the back of the freezer, for our return. Speaking of peppermint/candy cane ice cream, Mike and I went to Shake Shack, here in Tokyo (I had a crinkle cut fry craving, don’t judge) and the custard of the day was candy cane! Except when I ordered it, it wasn’t because apparently I don’t really know how to read Japanese. It was Christmas Cookie! And it was delicious, according to Mike anyway because I have a cold and I can’t taste anything. I know, you’re thinking , if you have a cold, what are you doing eating scratchy french fries and ice-cold custard when you can’t even taste it? Comfort, friends, it’s comfort eating. Besides, we had chicken ramen for lunch (couldn’t taste that either) so, you know, it balances out, right? 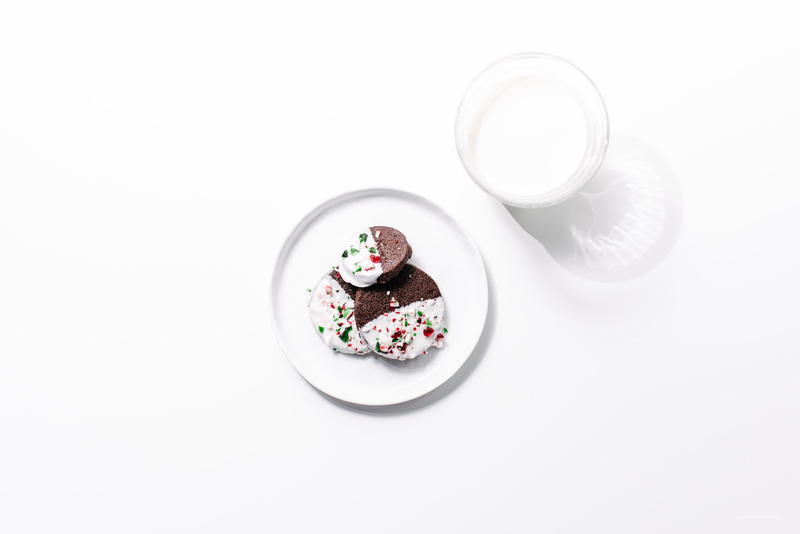 In a bowl, sift together the flour, cocoa, and baking soda. In the bowl of a stand mixer, using the paddle attachment, whip the butter on medium low until smooth. Add the salt and mix. Add the sugar and whip until light and fluffy, about 2 minutes. Scrape down the sides of the bowl and then add half of the flour mixture, mixing on low until the dough just comes together, about 15 seconds. Repeat with the remaining flour mix. Use your hands to combine the dough into a ball and divide into two balls. On a piece of plastic wrap, shape each ball of dough into a flat rectangle. Wrap tightly and refrigerate until firm, at least an hour. Remove both blocks of cookie dough from the fridge. Take one block and place between 2 pieces of parchment paper. Roll out until 1/4 inch thick. If at any point your dough is too soft, pop it back in the fridge. This is a dough that needs to be really cold for it to work. 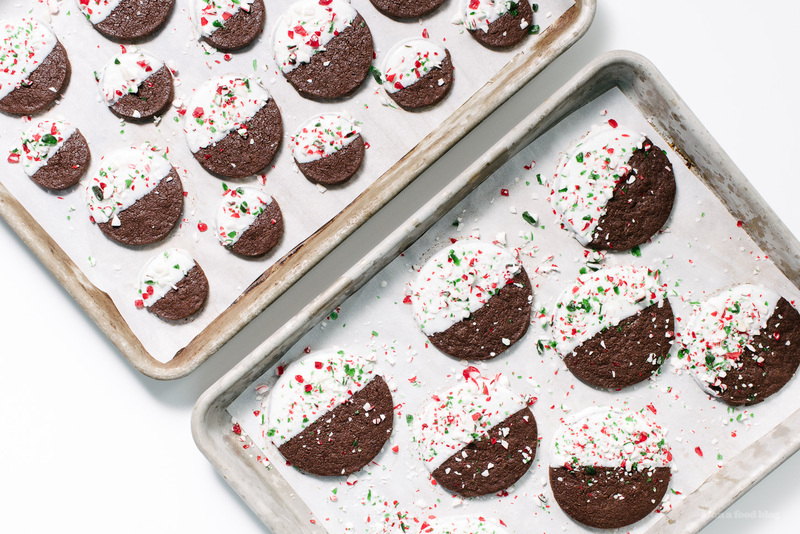 Cut out rounds and use an offset spatula to place on parchment paper lined cookie sheets. Let the cookie sheets chill in the fridge while you heat up your oven. Preheat the oven to 325°F and bake the cookies for 20-25 mins, rotating once, keeping an eye on them so they don’t overcook. Because the dough is so dark, it might be kind of hard to tell – look for small cracks on the surface. Remove from the oven and cool completely. Melt the chocolate, coconut oil, and peppermint extract in a bowl over a double boiler. Stir until smooth. Dip the cookies in the chocolate, letting the excess drip back into the bowl. 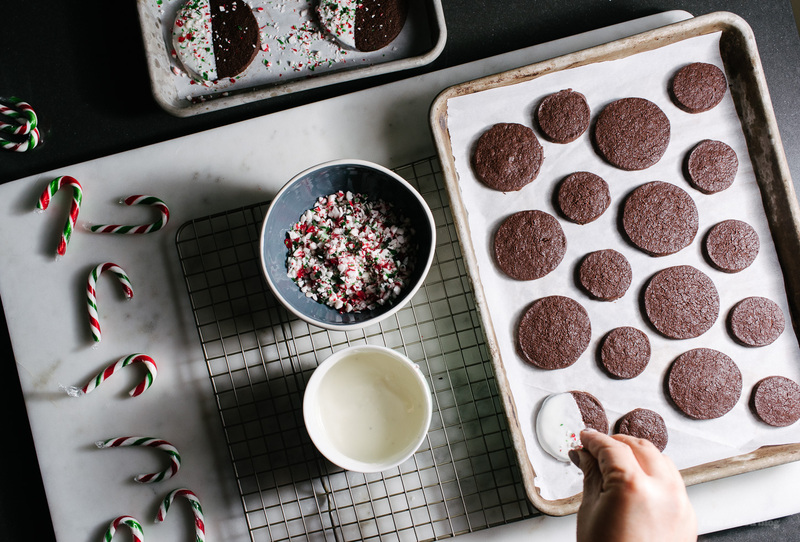 Place back onto the lined cookie sheet and sprinkle with crushed candy canes. Let the chocolate set in the fridge until firm. Enjoy! yay! i’ve been meaning to try the sugar cookie shake, but it’s been so cold here that i haven’t been able to convince myself to get it. glad to hear it’s good. and get well soon! I absolutely love that you put weights for ingredients on this recipe. My first step for trying every baking recipe is to break out my volume->weight guide and to translate everything. Wow these look amazing!! Thanks for sharing! 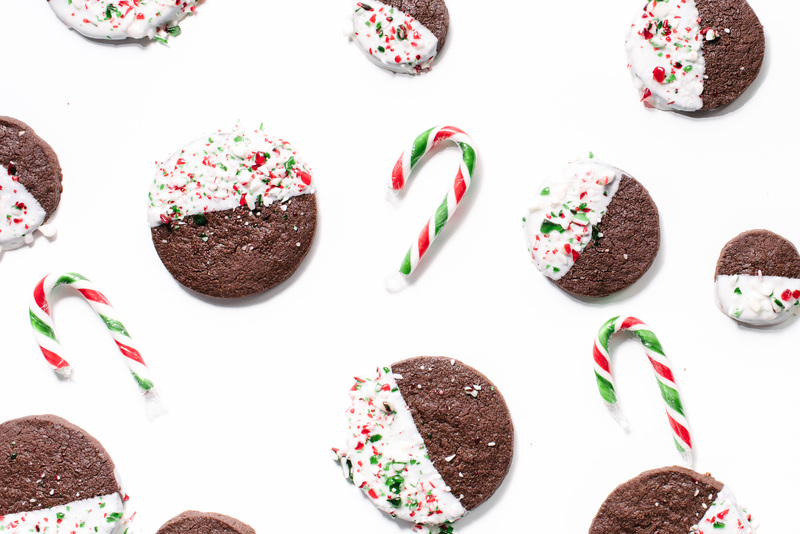 Looks yummy and so cute for the holidays. Will be added to my cookie trays for next year.